The Superset idea was presented to World Ventures during 2003, and since then the dream has been turned into a reality. Apart from funding, we were able to help build a professional management team. 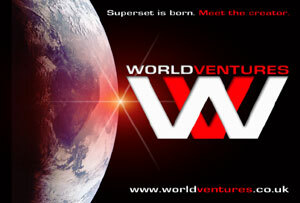 World Ventures recruited Edward Freedman as Superset's CEO. Freedman is the man who was credited with taking Manchester United FC from a portacabin to what it is today. He is also the man who helped create the musical phenomenon that was the Spice Girls. Superset is a one-day tennis tournament with prize money higher than ever before. Following a successful debut in the USA at Portland in 2003, and then the European launch at the Wembley Arena in the UK on the 3rd October 2004. Superset is a fusion of sport and entertainment. It is fast and furious with a team of 8 top world players battling it out in two sessions. The first being the eliminator leading to the final 4 players. The winner at Wembley takes prize money of £250,000! Instead of alienating the tennis community as one might have expected, the biggest factor in Supersets monumental rise in just one year has been its ability to gain the support of not only the worlds top players, but also the games management and governing bodies. Superset is similar to the one-day Cricket event which took the Cricket fraternity by storm. Superset is set to do the same! Go to www.superset.tv to see its latest events, stars, news, etc. World Ventures welcomes any interest in investment into Superset Tennis, or any of its ventures. Please contact World Ventures if you wish to express an interest.